January 12, 2019 by Dr. Randi Fredricks, Ph.D. He pops pills, watches soaps, and always, always says what’s on his mind. He’s Dr. Gregory House (Hugh Laurie). Producers David Shore, Bryan Singer, Katie Jacobs, and Paul Attanasio haven’t rewritten the hospital drama. At heart, it’s a cross between St. Elsewhere, ER, and C.S.I, but they’ve infused a moribund genre with new life and created one of TV’s most compelling characters. As fascinating as he is, the show wouldn’t work as well if it were all House all the time. Fortunately, he’s joined by an intriguing cast of characters, portrayed by a combination of experienced vets (Omar Epps, Lisa Edelstein, Tony winner Robert Sean Leonard) and new faces (Jennifer Morrison, Jesse Spencer). Aside from the complicated cases they tackle each week, the sparks really fly when House’s brilliant, if naïve charges are put to the test and as the head of a teaching hospital, it’s his job to test them, although his tough love approach is constantly landing him in hot water with Edelstein’s administrator. From the first episode, House attracted a talented array of guests, including Robin Tunney (“Pilot”), Joe Morton (“Role Model”), and Patrick Bauchau (“Cursed”) as Spencer’s father. In addition, Chi McBride and Sela Ward appear frequently (with Ward returning for the second season). Every baffling case. Every brilliant diagnosis. Every brutal insult. They’re all here in all eight seasons of House, M.D., the compelling medical drama that critics proclaimed one of the smartest and intellectually bravest shows on television. Two-time Golden Glober winner Laurie is House, Princeton-Plainsboro Teaching Hospital’s Chief of Diagnostic Medicine whose astounding intellect is matched only by his frightening bedside manner. Relive every captivating moment as House and his team of doctors solve complex medical mysteries, push professional boundaries, and face their own demons. Gripping, witty, and intelligent, satisfy your House addiction in this must-own 41-disc collection, featuring all 176 episodes of this Primetime Emmy and Golden Globe-winning television phenomenon. 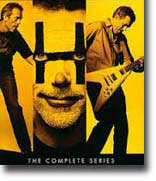 Character to watch: Hugh Laurie as House.